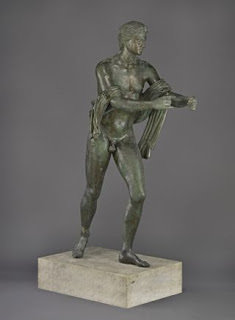 These are the first two works from Italy to arrive at the Getty Villa as a part of the agreement reached in 2007. 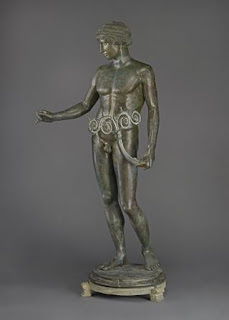 These bronzes, Ephebe as a lampbearer and Apollo as an archer will be loaned for two years. The Ephebe will go on display at the end of April, and the other will be displayed in a year after study and conservation. Karol Wight, the Getty's curator of antiquities says in the LA Times' art blog "We want the partnership to be mutually beneficial . . . But of course our concerns are highly aesthetic." First off: I am an employee of the Getty and every time I enter or leave my building, I see these two statues, trussed up in a conservation lab. Nevertheless, I am NOT an official mouthpiece of the Getty and these are my own thoughts on the matter. The Getty is treating these two statues with state-of-the-art methods and materials of conservation, practices that are unfortunately out of reach for most Italian (European, even) labs. These two works of ancient Roman sculpture--while not of tremendously high quality as far as ancient art goes--will be conserved for generations because of Getty's interventions. All at no cost to Italy at all. The statues will be displayed here after their conservation for a period of a couple of months, and then returned to Italy in a state better than when they left their homeland. As far as I know, none of the other American museums previously under fire for their illegal/immoral acquisition practices (e.g. the Met, the MFA) have offered this kind of service to the Italians. Those agreements seem to be simply traditional loans rather than including the costly, time-consuming, but ultimately invaluable work of conservation. It's not really a mutually beneficial agreement if the loans Italy give to Getty comes with the caveat that they have to repair the artwork as well. It seems very one-sided. A better agreement, if the Getty leadership was smart, is that the museum would get first refusal of major artwork for sale by the Italian government, and longer term loans.